Stan Freberg passed away today. 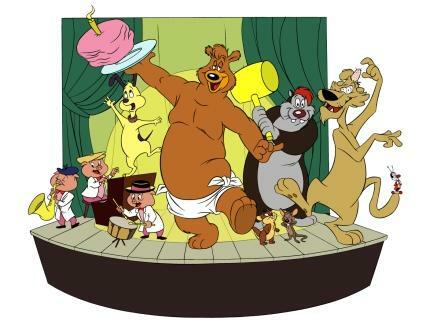 In my younger years I only knew him from the acting he did for Warner Bros., as the voice of Pete Puma in “Rabbit’s Kin,” Junyer Bear, narrating and performing the Three Little Bops, the Gambling Bug, Benny the Cat, Bertie the Mouse, Tosh the Gopher and Chester the Dog. However, Warners management thought the illustration inappropriate and I was never reimbursed for my labor. The original, alas, disappeared. Fortunately I had made a copy. I scanned it and colored it digitally. The next step was to get it to Stan as my own personal gift to him. Fortunately, Mark Evanier brought Stan to the San Diego Comic Con for a panel saluting him. Afterward, Stan availed himself in the Exhibition Hall to sign autographs and to sell copies of his 1988 autobiography, It Only Hurts When I Laugh. I handed him a copy of the illustration, and his face lit up with joy when he saw the characters he voiced. I was thrilled by his response. Of course, Stan Freberg has done a lot more contributions to pop culture, which you can read about here. Mark Evanier has written a marvelous tribute to Freberg here.